The weather turned out much better than forecast. 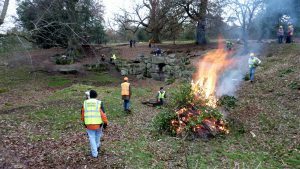 Still a cold wind blowing from the East, but the rain held off for the 14 volunteers to enjoy a good morning’s work, and to welcome our visitors.. Task 1 We started attending each and every staked whip and shrub that we had planted in February to ensure that a secure wire surround was fitted, and that protective tubes were well anchored. We tidied up the immediate surrounds of all new whips and young trees. This will be the start of a continual process to prevent Ragwort smothering the new trees before they are properly established. Stephen, with help from Andy, continued to expose wrought iron panels deeply buried on the East side of the site, which we plan to lift and use as infills to complete the run of fencing on the West side, adjacent to the site entrance. We welcomed Dr Peter Blake. 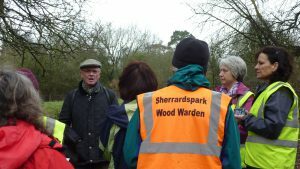 Peter is the Area Representative of the British Fern Society, and he had travelled across from Norwich in poor weather to join us. Peter and Nick were given a guided tour around the site, which they were surprised to find is more extensive than they had imagined. 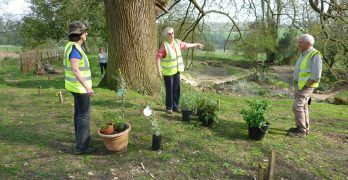 They also saw that we do not have many ferns showing at this time, but nevertheless Peter gave us good advice on the types of ferns we should be aiming to plant, and he also recommended the areas on the site where they would do best. Peter Blake declared that he looks forward to visiting us again, although unfortunately he will not be available to join us on our Open Day on Sunday 17th June 2018. It is evident that Peter will spread the word about our Project within the BPS, and hopefully thereby attract their interest in our activities. Through our membership of BPS we will hope to gain the benefit of members’ advice and perhaps their surplus stock too! Following the visit, we were asked to provide The Pteridologist with a Report of our activities for publication in the next edition of their regular Journal, all of which attracts wider publicity to our benefit. All the above dates and details can be found on our website under the Calendar Tab. N.B. Maydencroft operatives and their heavy equipment will be on site from Monday 9th April to 20th April and extra precautions will need to be taken. Visitors – Area Representative of the British Pterodological Association. Weather permitting Mr Peter Blake will be visiting from Norwich. We hope that he will be able to give us the benefit of his knowledge of the types of ferns we might aim to plant, and their best positions. He will also then be in a position to talk about our plans and ambitions to other members of the BPS . Publication of this Notice has been delayed due to unavoidable last minute adjustments to our Work Schedules, which will affect this coming Thursday 15th March 2018, and the following two months too. Rabbits have been nibbling/destroying some of the plants/trees we have recently planted. We have to prevent that happening before we start planting tender plants. Sarah, our Garden Designer, will be absent until 21st April and we will not therefore be able to place the ‘Big April Order’ for the remainder of the plants on the Planting List, until she returns. Sarah needs to be present to direct planting operations. A delay in the next round of planting from April to May 2018 offers perceived benefits. Sweet new grass will have started growing and (we are told on good authority) rabbits prefer grass to nursery grown plants. 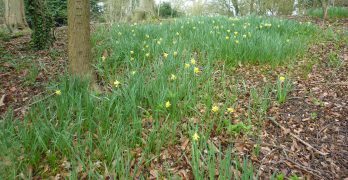 A delay of planting by one month (to May 2018) will enable the Maydencroft mechanical digger to undertake scheduled 2 x week tasks (from 9th – 20th April) without the earlier concerns we had of interference with the parallel work of the volunteers on the planting programme. The mechanical digger is scheduled to reduce (i.e. 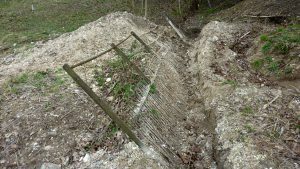 lower) some planting beds; undertake further spoil removal from the rockwork; extend earlier excavation of paths and earthworks. 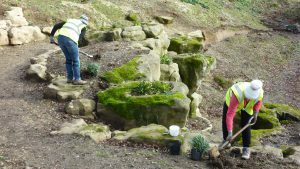 The mechanical digger will also lift the tufa rocks from the central planting bed in the dell, to be stored for future use, and also remove rocks dropped by vandals in the dropping well basin. 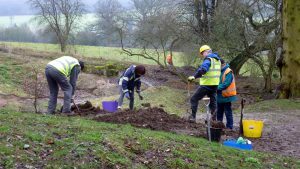 By synchronising Work Party activities with the work of the mechanical digger, volunteers will have more time to prepare new beds for planting before Sarah’s return, and before the purchase of the next tranche of plants. (Contractors are reducing the rabbit population for us). 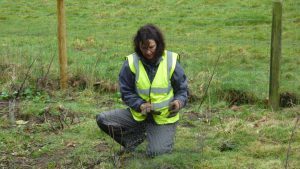 We have to double-check that all the recently planted trees/shrubs are protected either by plastic tubes or by chicken wire. Plastic tubes should be buried in the ground by approx. 1″- 2″ so that rabbits cannot push them aside. Chicken wire should ideally be pegged in triangles with approx 4″ gap between the wire and the plant, to stop rabbits nibbling through the wire. 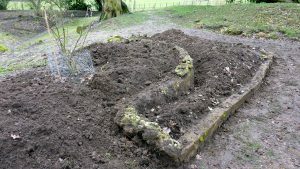 This is a continuation of the work that Sarah and her gardening team have been undertaking in recent months. If we have a bonfire nettles can be burnt. 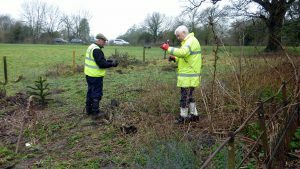 As rabbit protection is checked/improved for each plant, (see Task 1 above) a start needs to be made to clearing grass and weeds (including ragwort) from an an area of approx. 12″ diameter around each plant, which cleared space should then be maintained on an ongoing basis. If the Weather is suitable we will have a bonfire. This will be the first step towards site clearance in preparation for the Open day on June 17th 2018. There are fallen branches laying around the site, and nettles to be burned as they are dug up. Mulching Cage No. 1 also needs to be opened and sorted to remove material that should be burned. 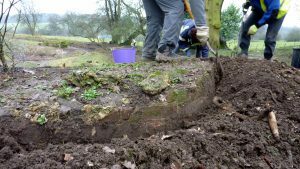 Depending on resources available, we will continue to expose the brick walls at the North end of the site, in preparation for the April arrival of the Maydencroft digger. We will also continue to trace the direction of the path at the top of the steps on the South side. Our training day with Tony was postponed because of inclement weather. 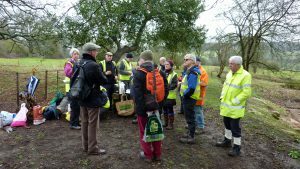 We will meet at 10 am at The Fernery on Thursday 15th March 2018. The leaders will expect to be on site from 9.30 am to get the tools ready, so if you are an ‘early bird’ and can help, please do so. As mentioned above, we are expecting visitors from the British Pteridological Society. The long range weather forecast for Thursday is bad – very heavy rain is expected. Common sense will come into play, as the site might get too dangerous and work will be abandoned. 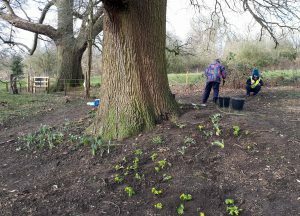 The prime purpose of many of the bare-rooted trees planted on 23rd February is to restore the shelter which the more delicate ferns and other specimen plants would have enjoyed in the past. An equally important purpose is to screen the site from unwelcome Motorway views, (not a Victorian problem), whilst also presenting seasonal blocks of colour and interest which will frame the many other vistas to be enjoyed from within the Fernery. Kate Banister of the Hertfordshire Gardens Trust kindly sent me a copy of this extract on 10th February 2017, and it has sat in my files, waiting for an opportunity to develop the website so that we might present it in the wider context of the history of the development of Anthony Parson’s Fernery. Kate Banister opined when she sent this extract to me, that this report from ‘the man himself’ presents clear enough evidence that originally the grotto would have housed a seat. Kate also concludes that the quoted reference to ‘chaste foliage‘ would indicate that the purpose of the grotto and seat, and its secluded position within a ‘dingle and dell’ setting, overlooking rocky beds and ferns, would likely as not have been for courtship! 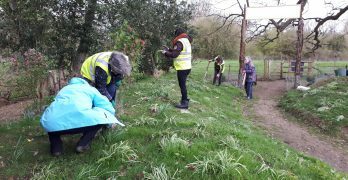 At short notice the Borough Council delivered 500 x Snowdrops and 500 x Aconites – all ‘on the green’ (i.e. well rooted with full stems and leaves). 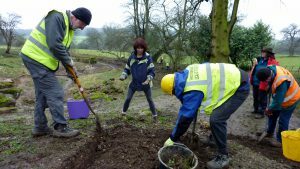 We had to get them planted in a hurry, and volunteers stepped forwards to help on 25th February 2018. But because of fears of frozen ground a last-minute postponement was circulated. 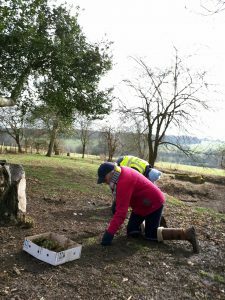 As happens, a few volunteers who hadn’t received the ‘postponement notice’ did nevertheless turn up and perversely we found that the ground underneath the large oaks was in fact in perfect condition. So, although bitterly cold, the five of us got busy! Apologies go out to all those volunteers who, but for the ‘postponement’, would have joined us. Sarah directed the planting and we have created a ‘Spring Bed’ which will in time show well.